Christmas and Epiphany (Theophany) are among the most important feast days in Christianity. Most denominations celebrate the two feasts separately. However, the Armenian Apostolic Church celebrates the Nativity of Jesus Christ on the same day as Epiphany. There was no such holiday as Christmas during the early years of Christianity, partly because the date of Jesus Christ’s birth was unclear. In Eastern Christianity, for example, the birth of Jesus was celebrated on the same day as his baptism, January 6. The holiday was named Epiphany (Greek for “manifestation” or “appearance”) because it honored the revelation that Jesus Christ was the Son of God. In 451, the Council of Chalcedon separated the celebration of the Nativity of Jesus from the celebration of the Baptism of Jesus, formally establishing Christmas as a separate feast. The decisions adopted by the council are accepted by the Catholic Church, the Eastern Orthodox Church, and most Protestants. However, Oriental Orthodox churches, including the Armenian Apostolic Church, don’t agree with the conduct and the proceedings of the council. Therefore, the Armenian Apostolic Church didn’t recognize the separation of Christmas and Epiphany and continued the original practice of celebrating the birth of Christ on the same day as his baptism. The holiday that is sometimes referred to as “Armenian Christmas” is actually the feast of Theophany. 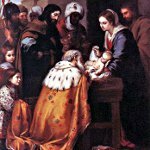 Epiphany in Armenia is celebrated on January 6, on the same day that Western churches celebrate it, because the Armenian Apostolic Church uses the Gregorian calendar. It is an official public holiday in Armenia. The feast of Epiphany in Armenia is preceded by a seven-day fast. On the eve of Epiphany, the Divine Liturgy is served, honoring the manifestation of Jesus Christ as the Son of God. The service is referred to as “the Eucharist of the lighting of the lamps” because of an old custom that involves parishioners taking home oil lamps and candles lit at the church. This act symbolizes the church’s blessing. The Liturgy is followed by another old ritual, the blessing of water. The priest immerses the cross into the water, which is meant to symbolize Jesus Christs’ descent into the Jordan River for baptism, and pours myrrh over it. After the Liturgy held on the morning of January 6, the cross is removed from the vessel. All parishioners come forward to kiss the cross and drink holy water. Most of those who attend the morning Liturgy take some blessed water home because they believe in its ability to cure physical and spiritual ailments. Many Armenians gather for a festive meal called khetum on the eve of Epiphany. Since devout Armenians fast for a week before the feast, the meal is light and easy on the stomach. A richer dinner is prepared the next day. Khetum traditionally includes dishes such as tanapur or spas (a light yogurt and wheat/barley soup), nevik (Swiss chard with chickpeas), fish, dried fruits and nuts, sharots (candies made of nuts threaded onto a string and coated in thickened grape juice), and anoushabour (sweet wheat/barley pudding with fruits and nuts).